Twisted Mansion is the third race track in the Flower Cup of Mario Kart 8 and Mario Kart 8 Deluxe. 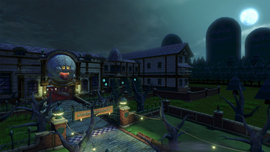 This course is a large haunted mansion inhabited by many Boos, and as such it can be considered as a spiritual successor of Luigi's Mansion from Mario Kart DS. There are fifty-one Coins located on this track. This is one of the three courses (along with Mario Circuit and Toad Harbor) that were playable at E3 2013. Coincidentally, all three take place in the Flower Cup, in the same order as the original demo. This track was originally called "Boo House" during E3 2013. At the starting line, the player starts in the courtyard, where a large statue of Boohemoth can be seen. As the race starts, the door will slowly creak open. Once the player drives inside, they drive into an anti-gravity section that leads through the dining room. At the dining room, the track splits and the player can drive on either wall, after which anti-gravity ends. The player then goes through a library, and into another anti-gravity segment, traveling into an underwater corridor through an arch shaped like Bouldergeist's head. The underwater section eventually splits into two paths,where Fish Bones can be seen. The upper route leads to a higher boost pad than the lower. Both end in a glider segment across a courtyard similar to the one in Luigi's Mansion. If the players take the upper route, they can land on a balcony and take a shorter route, whereas the lower one must climb a flight of stairs. They then exit the house, which leaves the final stretch to the finish line. Here, some Hammer Knights being possessed by Boos attack. After the first split path anti-gravity section, there is a dirt section, through the aisle in the library, that the player can boost through with a Mushroom, Golden Mushroom or Stars. At the end of the course, using a type of boost, the player can bypass the Hammer Knights and the final turn. The staff ghost for this track is Luigi on the Mach 8, with a time of 2:16.195. In Mario Kart 8 Deluxe 200cc, the staff ghost is King Boo with a time of 1:38.244. During the countdown to the race, the doors at the entrance of the mansion open up. This is one of five courses (the others being Mount Wario, Electrodrome, Bowser's Castle, and Excitebike Arena) to have an opening animation during the countdown. This course's music played as the background music for the Wii U's eShop during Halloweens 2014, 2015, 2016 and 2017 in North America. It also played as the background music for the Nintendo 3DS' eShop during Halloween 2017 in the same region. This page was last edited on February 1, 2019, at 15:13.